This lease form is for a dental office with the tenant being responsible for payment of its prorata share of operating costs for the medical professional office building. The form contains a tenant only termination right in the event of death or disability of the dentist occupying the premises. 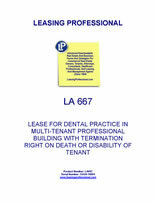 This Lease is made as of _________________, by and between COMMERCIAL PROPERTY LANDLORD, INC., a __________________ corporation ("Landlord"), and AGREEABLE DENTAL TENANT, INC., a _________________ corporation ("Tenant"). Approximately _______ square feet of usable space located on the ____ floor of the Building, said Premises to be located approximately as shown on the drawing attached hereto as Exhibit "A-1" and made a part hereof by reference. The Premises shall be prepared for Tenant's occupancy in the manner and subject to the provisions of Exhibit "B" attached hereto and made a part of hereof. 2. Tenant shall have and hold the Premises for a term commencing on the date (the "Commencement Date") which is the earlier of (i) ten (10) days after the date on which Landlord notifies Tenant that the Premises are substantially complete or (ii) the date Tenant first occupies the Premises for business, and shall terminate at noon on the last day (the "Expiration Date") of the sixtieth (60) full calendar month following the Commencement Date, unless sooner terminated or extended as hereinafter provided. Promptly following the Commencement Date, Landlord and Tenant shall enter into a letter agreement in the form attached hereto as Exhibit "C", specifying the Commencement Date, the Expiration Date, the exact amount of space contained within the Premises and the exact amount of the monthly Base Rent (as hereinafter defined) payable hereunder from the Commencement Date through the first Lease Year, (as hereinafter defined). The Term "Lease Year", as used herein, shall mean each and every twelve (12) month period during the term of this Lease, with the first such twelve (12) month period commencing on the Commencement Date, if the Commencement Date is on the first day of calendar month; and, if not, the first such twelve (12) month period shall commence on the first day of the calendar month immediately following the Commencement Date. 3. Tenant shall pay to Landlord, at ­­­­­­­­­­­­­­­­­­­­­­____________________, or at such other place as Landlord shall designate in writing to Tenant, an annual rental, initially in an amount equal to $____ times the number of square feet of usable area contained within the Premises, to the nearest square foot, payable in equal monthly installments (hereinafter referred to as "Base Rent"), due on the first day of each calendar month, in advance, in legal tender of the United States of America, without abatement, demand, deduction or offset whatsoever, except as may be expressly provided in this Lease. One full monthly installment of Base Rent shall be due and payable on the date of execution of this Lease by Tenant for the first month's Base Rent and a like monthly installment of Base Rent shall be due and payable on or before the first day of the calendar month following the Commencement Date during the term hereof; provided, that if the Commencement Date should be a date other than the first day of a calendar month, the monthly Base Rent installment paid on the date of execution of this Lease by Tenant shall be prorated to the end of that calendar month, and the excess shall be applied as a credit against the next monthly Base Rent installment. Tenant shall pay, as additional rent hereunder, all other sums due from Tenant to Landlord under this Lease (hereinafter referred to as "Additional Rent") (the term "Rent", as used herein, means all Base Rent and Additional Rent payable hereunder from Tenant to Landlord). 4. Landlord and Tenant agree that the Base Rent set forth in Paragraph 3 above shall be increased annually on the first day of each Lease Year by an amount equal to three (3%) percent of the Base Rent payable hereunder for the previous Lease Year. 5. Other remedies from non-payment of Rent notwithstanding, if the monthly Base Rent is not received by Landlord on or before the tenth (10th) day of the month for which the Base Rent is due, or if any other payment due Landlord by Tenant is not received by Landlord on or before the tenth (10th) day of the month next following the month in which such payment is due as herein provided or in which Tenant was invoiced, a late charge of five percent (5%) of such past due amount for each month such amount is past due shall be due and payable as Additional Rent in addition to such amounts owned under this Lease. 6. No payment by Tenant or acceptance by Landlord of an amount less than the Rent herein stipulated shall be deemed a waiver of any other Rent due. No partial payment or endorsement on any check or any letter accompanying such payment of Rent shall be deemed an accord and satisfaction, but Landlord may accept such payment without prejudice to Landlord's right to collect the balance of any Rent due under the terms of this Lease or any late charge assessed against Tenant hereunder. 7. No failure of Landlord to exercise any power given Landlord hereunder, or to insist upon strict compliance by Tenant of his obligations hereunder, and no custom or practice of the parties at variance with the terms hereof shall constitute a waiver of Landlord's right to demand exact compliance with the terms hereof. Time is of the essence of this Agreement. 8. Tenant shall use and occupy the Premises only as an office for professional services associated with Tenant's practice of medicine or dentistry, as aforesaid, and for no other purpose whatsoever, and such use shall be performed in strict compliance with the Code of Ethics of such profession. The Premises shall not be used for any unlawful purpose, nor shall Tenant cause, maintain or allow any nuisance in the Premises or the Building nor use or allow the use of the Premises for any purpose in violation of zoning requirements and conditions applicable thereto or of any valid regulation of any governmental body, nor in any manner to create any trespass or to vitiate the insurance or increase the rate of insurance on the Premises or the Building. If Tenant, or any dentist practicing with Tenant, loses his license or is convicted of a felonious criminal offense, Landlord shall have the right, at Landlord's election, to terminate this Lease.